Watch as the streets of Historic Old Town San Diego transform into an art extravaganza at this year’s Old Town San Diego Art Festival! On Saturday, October 5 & Sunday, October 6 from 10:00 AM to 6:00 PM, the Old Town Chamber of Commerce invites you to experience a world full of colorful art, live music, international food and exotic wines. Stroll down San Diego Avenue as the streets fill with a variety of artists, food, wine, and entertainment. Feast your eyes on elaborate displays of paintings, sculptures, ceramics, jewelry, and furniture while you fascinate your taste buds with delicious cuisine! This event is free to the public, and the Old Town Art Festival offers something for everyone! The kids are sure to be entertained throughout the weekend with the 2nd Annual Youth Artist Competition! Children are invited to bring their original works of art to display for festival goers and judges alike. Whether your child is the next Picasso or just starting to dabble in the art world, all levels of young artists are encouraged to participate in this friendly competition. As your children admire the work of their peers, they will have the opportunity to create their own masterpieces! Local artists and instructors will be on hand to lead kids through interactive crafts and activities so that the children can discover their true artistic abilities. 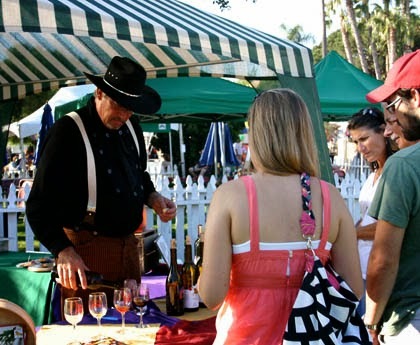 As you work up a hearty appetite exploring the streets of Old Town, stop by the delicious and exquisite food and beverage options offered from over a dozen of San Diego’s amazing restaurants and vendors lining the streets. There will be everything from popcorn and candy to extravagant dishes and desserts that will cater to all your hunger needs. You can take your food with you as you explore the decorated streets of Old Town, or find a seat and dine with friends. Now that you have calmed your cravings, be sure not to neglect your thirst! If you’re 21 and over, you can sample some of the finest wines and beers, which will make your festival experience that much more enjoyable. For those who take a particular liking to wine, there will be a whole garden dedicated to your favorite fermented grape beverage! Local and national wines of all tastes and flavors will be at your disposal. With a satisfied appetite, you can relax, dance and enjoy as the sound of live music floats through the streets of Old Town. Experience an array of colorful art, live music, international food and exotic wines at this two-day festival, which is sure to be a memorable weekend for people of all ages and backgrounds. 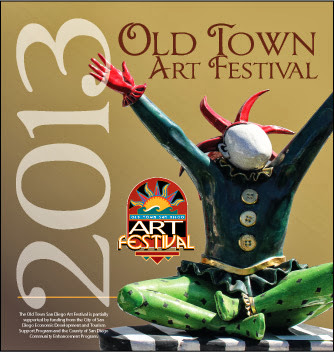 For more information, call (619) 233-5008 or visit OldTownArtFestival.com.